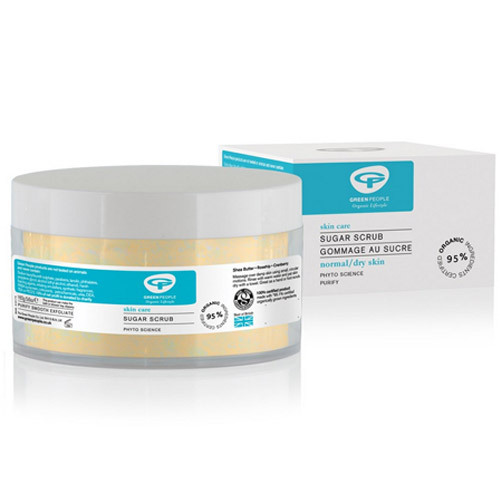 Green People Organic Sugar Scrub is a gentle exfoliator for super soft, glowing skin. Divinely soft skin can be yours with this luxurious organic body exfoliator made with pure sugar cane crystals. Gently exfoliates for touchable, glowing skin all over. Deluxe blend of organic sugar and skin-softening oils. Allows moisturisers to penetrate the skin more effectively. Green People Sugar Scrub is made without parabens, phthalates, petrochemicals and artificial fragrances to bring you the purest sugar sccrub that nature can offer. Sucrose (raw cane sugar)*, Butyrospermum parkii (shea) butter*^, Cocos nucifera (coconut) oil*^, Sorbitan olivate (emulsifier from olive oil), Simmondsia chinensis (jojoba) oil*, Aqua (spring water), Rosa moschata (rosehip) seed oil*, Punica granatum (pomegranate) seed oil*, Lecithin* (plant-based emulsifier), Calendula officinalis (marigold) oil*, Helianthus annuus (sunflower) seed oil*, Vaccinium macrocarpon (cranberry) seed oil*, Persea gratissima (avocado) oil*, Olea europaea (olive) leaf extract, Aroma [Lavandula hybrida super (lavandin) oil*, Rosmarinus officinalis (rosemary) oil*^,Cymbopogon citratus (lemongrass) oil*^, Commiphora myrrha (myrrh) oil^], Limonene*, Linalool*, Citral*, Geraniol* (from essential oils). Massage over clean, damp skin using gentle pressure and small, circular motions taking a bit more time over dry, rough areas such as elbows, knees and heels. Rinse with warm water and pat skin dry with a towel. Use twice a week. Below are reviews of Green People Organic Sugar Scrub - Body Scrub - 160g by bodykind customers. If you have tried this product we'd love to hear what you think so please leave a review.